Indian classical music is improvised during performance. While following the structure of a raga a musician improvises in several ways ranging from using the sound 'aa' to explore the melodic possibilities of the raga without adhering to any tala (set rhythm), to enunciating the names of notes as they are sung in a specific tala. South Indian, or Carnatic, music is organised around a system of 72 scales (melakarta ragas) and is today based on a large number of songs, composed mainly by three great composers - Shyama Shastri, Thyagaraja, and Muttuswamy Dikshitar. Nevertheless, in performance, vocalists and instrumentalists embellish each phrase, so that every performance of a composition is unique. The music which accompanies dance, on the other hand, is often composed and set, especially when the dancer expresses rhythm and melody with the dance steps typical to a particular dance form. In Bharata Natyam, though the mime and hand gestures which express the meaning of songs are usually improvised, musicians are expected to follow the dancer. Thus dance musicians are usually distinguished from concert artists, and rarely would a musician of stature sing or play for a dancer. Inspired by the wonderful music of Aruna Sairam, the internationally acclaimed Carnatic vocalist, Rajika Puri explores ways of adapting Bharata Natyam so that it can be improvised during a regular Carnatic music recital. She uses its vocabulary and specific style of mime to visualise the music as it is created by the singer - following the music rather than leading it, and attempting not to interfere with its flow. 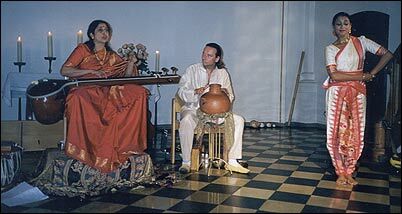 In May 1999, Rajika joined the tour of ARUNA, a programme in which Christian Bollmann and Michael Reimann fuse European overtone music and the sounds of several international instruments with her singing. In keeping with the sacred nature of Indian music, they performed in churches in Koln, Aachen, & Darmstadt, among other German towns. In June-July 2000, Rajika will participate in Aruna's tour of Spain, during which they both wish not only to introduce Spanish audiences to Carnatic music, but also to meet with flamenco singers and guitarists, in the hope of future collaborations related to Flamenco Natyam.